EDITED: Click over HERE to find out how you can win a pair of these. Giveaway ends April 30, 2012. String a glass bead, spacer, faceted bead, and spacer on a 2 inch head pin. Form a simple loop at top. Open the loop on the ear wires and attach earring wire to bead unit. Close ear wire loop. Repeat for second earring. I'm so loving your earrings lately! Do you have an Etsy shop? Thanks for sharing at Handmade Tuesdays! You're so inspiring! 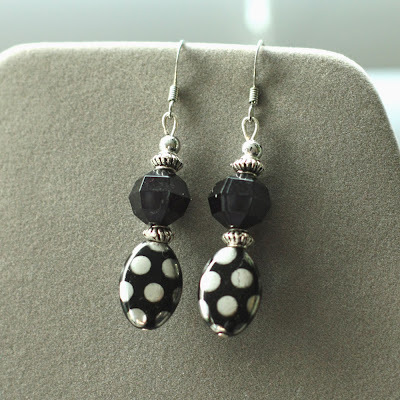 Very cute earrings! Makes me want to go out and buy some beads today and create some jewelry! Thanks for the inspiration!